Holocaust survivor Adolek Kohn flashes the V for victory sign as he stands in front of one of the ovens at the Auschwitz death camp in Poland in this image taken from video. JERUSALEM  Hes a Holocaust survivor dancing with his family on what easily could have been his own grave. A video clip of Adolek Kohn awkwardly shuffling and shimmying with his daughter and grandchildren to the sound of I Will Survive at Auschwitz and other sites where millions died during the Holocaust has become an Internet sensation. Its also sparking debate over whether the images show disrespect for those who perished  or are an exuberant celebration of life. The fight  raging on Facebook, Twitter and elsewhere  poses uncomfortable questions about how to approach one of historys greatest tragedies: Whats the proper way to commemorate it? Can a survivor pay homage in a way that might be unthinkable for others? Adding to the irony, Kohn and his dancing brood owe their fame to neo-Nazi groups who posted the clip on their websites and turned it viral, his daughter told The Associated Press on Thursday. The 4½-minute video opens with the 89-year-old Kohn, his daughter Jane Korman and three grandchildren dancing near the infamous railroad tracks leading to Auschwitz. The group then moves to other Holocaust locations across Poland and Germany, including the notorious Arbeit Macht Frei (Work sets you free) sign at Auschwitzs entrance, Polands Lodz ghetto and the Dachau concentration camp. In one eerie shot, with his family behind him, Kohn presses his face to the small opening in a cattle car of the type that transported so many to their deaths. In another, he raises his arms and leads the troupe in a conga line to the pulsating disco beat of the Gloria Gaynor song. 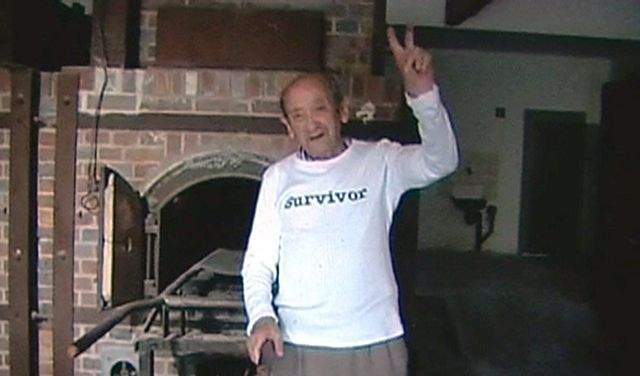 Kohn, shown at one point wearing a white T-shirt emblazoned with the word Survivor and flashing a V-for-victory sign, told Australias Nine Network he didnt think the video was offensive because the dance was distinct from the memory of those who died. We came to Auschwitz with the grandchildren and created a new generation, thats why we danced, he said. Korman, a Melbourne-based artist now visiting Israel, filmed the clip during a trip she took with her father, four children and a niece last summer to Kohns native Poland, and to places in Germany and the Czech Republic where he once lived. Her parents, both Auschwitz survivors, fully support the video, Korman told the AP. They both say ... We came from the ashes, now we dance, she said. The clip was posted on YouTube in January, but didnt attract attention until several weeks ago after neo-Nazi groups put it on their websites, she said. It originally was part of a video installation Korman presented in Melbourne last December. While the footage has become an unlikely Internet hit, the controversy it has triggered is less surprising. Michael Wolffsohn, a German Jewish historian at the Bundeswehr Munich, called it tasteless and questioned Kormans motives. It is simply embarrassing self-promotion, he said. If this video would be in his family album nobody would care about it. But because it is in the World Wide Web, the video received public attention it does not deserve, said Rabbi Andreas Nachama, director of a museum located on the site of the former Gestapo headquarters in Berlin. However, Piotr Kadlcik, the head of Polands Jewish community, said reactions were mixed among Warsaws Jews. He didnt find it offensive, he said, because it was made by a Holocaust survivor.